Image speaks itself. 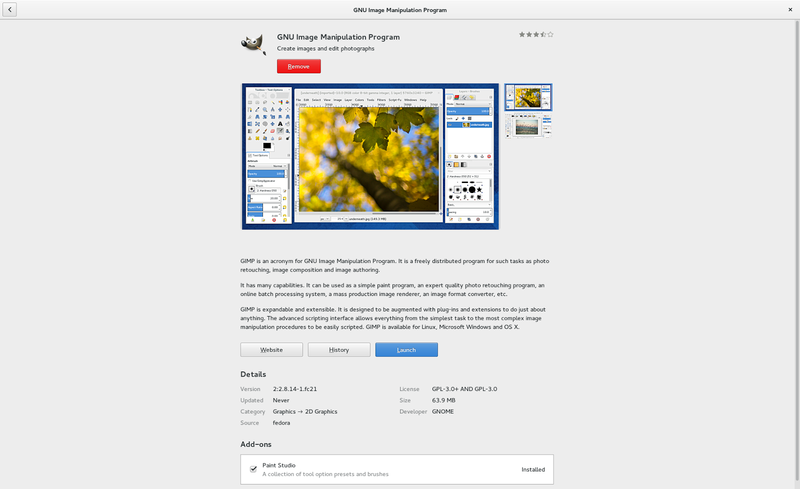 gimp-paint-studio package just got an metainfo needed for Gnome Software Center as add-on for Gimp based on related Richard Hughes' blog. The updated package will be shortly available in Rawhide and also in Fedora 21 updates-testing repository. It will not be included for Fedora 20 due to the preview release of Gnome Software lacking addons support. Next step will be contacting upstream adding that metainfo. Hopefully other add-ons maintainers for applications such as Inkscape and Blender will do the same to bring a richful experiences to users.